Temperature-Resistant – From -40°C to 121°C. Tough-Tags resist boiling water baths, autoclaving and moderate freezer temperatures. Tough – Chemically inert, polyester sheets resist most organic solvents and caustic agents. They adhere to most plastics*, glass and metals without cracking, peeling or degrading. Compatible – Tubes labeled with Tough-Tags easily slide in and out of centrifuge rotors without binding. Specially Designed – Label sheets are specially top-coated to readily accept laser printing. Heat-resistant, stay-flat sheets will not jam in laser printers. 1. 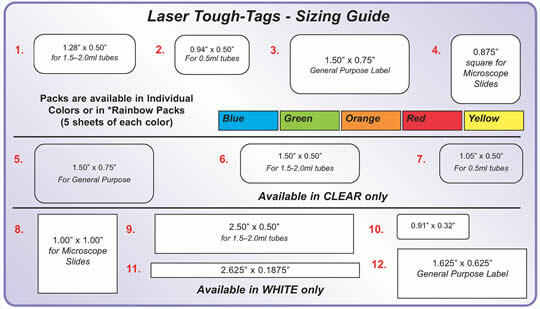 Laser Tough-Tags® size 1.28" x 0.50" (33 x 13 mm). Ideal Use: 1.5 ml tubes. 2. 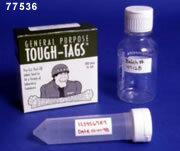 Laser Tough-Tags® size 0.94" x 0.50" (24 x 13 mm). Ideal Use: 0.5 ml tubes. 3. 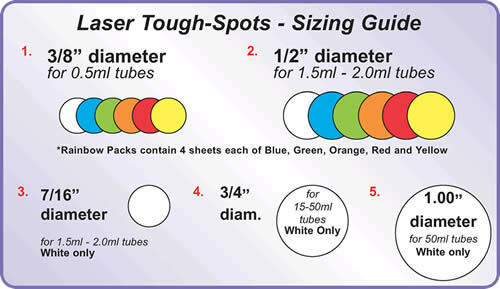 Laser Tough-Tags® size 1.50" x 0.75" (38 x 19 mm). Ideal Use: for 384-well plates, half skirted PCR plates, petri dishes etc. Convenient – Dispensing box assists in labeling individual tubes used in small experiments. Bake Tags are remarkable oven-safe labels that will adhere to any surface and withstand conventional ovensterilization (typically 180°C) or heating to inactivate RNase, DNase and other enzymes. 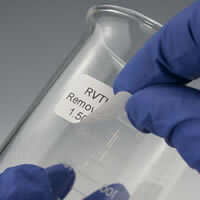 Unlike conventional labels that become brittle, darken and fall off bottles, beakers, pipet canisters and other containers in the oven, Bake Tags withstand heat sterilization, autoclaving, cryogenic freezer storage conditions (liquid nitrogen) and boiling water baths without experiencing any problems. Bake Tags resist most organic solvents and caustic agents, e.g. alcohols, most aromatic and some chlorinated solvents as well as acids and alkalis. We offer in either sheets (for laser printer) or on a roll. Easy To Write On – PVC labels accept writing from most lab markers including our Solvent Resistant Pens and Teeny Writers. Options – A variety of sizes, colors and formats ensures the right label for the job. Temperature-Resistant – Withstands freezer temperatures down to 196°C (liquid and vapor phase nitrogen), boiling water baths (100°C), autoclaving and moderate oven temperatures (150°C). Tough – Chemically inert labels resist most organic solvents and caustic agents. They adhere to plastics*, glass and metals without cracking, peeling or degrading. 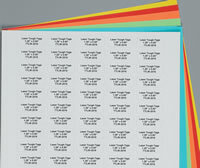 Specially Designed – Label sheets are specially top-coated to readily accept laser printing. Heat-resistant, stay-flat sheets will not jam laser printers. Innovative – Made with a flexible, polyolefin† label material and acrylic adhesive. This unique combination expands and contracts together with temperature fluctuations, resulting in a strong adhesive bond. Save Time – Preprinted Tough-Spots make labeling and identifying samples quick and easy. 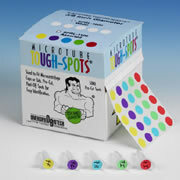 Use the numbered Tough-Spots to identify a series of samples - no handwriting or printing needed. Color Coded – The best of both worlds! Each color coded ToughSpot has a distinctly different color to identify similar samples and also includes a white area to clearly write a quick note about it. Safety – Lab safety is always a top priority. Use the Biohazard or Radioactive Tough-Spots to identify tubes or other vessels containing hazardous materials. The Tough-Tag Dispenser – For use with Tough-Tags, Cryo-Babies and Tough-Tag Spots up to 1⅜" wide. Hold up to 4 rolls. Conveniently holds up to 6 rolls of Tough-Tags, Tough-Spots or Cryo-Tags. Utilize the ledge to easily write on labels for sample identification. Proper identification of samples is often a key objective of the research laboratory. The process of writing on sample tubes/containers can be messy and unreliable. It can also be difficult to find the time to access a computer and design a layout for expensive ink jet labels. The new LABeler™ Lab Printer provides the convenience of a lab pen with the benefits of a large desktop printer. Simply type in the desired copy using the 50+ button key pad and press the print key and within seconds your label can be cut by pressing the cut lever and is then ready for application. 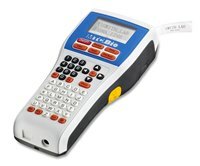 With over 15 available sizes, colors and material combinations, the LABeler™ is ideal for label identification of any laboratory vessel for nearly any laboratory application. Standard label tapes can be autoclaved, boiled or even frozen to temperatures as low as -50°C. 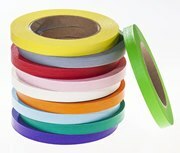 Special Ultro-Low label tapes are also available for storage in -80°C environments or for liquid nitrogen applications. Thermal Transfer Tough-Tags are a reliable and convenient way to identify samples with text or a barcode on microtubes, microplates, bottles and other laboratory containers. Resists Degradation from scuffing, chemicals, moisture and wide temperature fluctuations. Print as little as one label at a time, eliminating label waste and saving time and money. Unique solvent-resistant, acrylic-based adhesive provides excellent cold temperature performance. Specially coated for use with a resin ribbon that provides the best performance under extreme conditions. Print crisp, clear, professional quality labels. Temperature-Resistant – From -196°C to 70°C and also freezable in liquid and vapor phase nitrogen. Tough – They adhere to most plastics, glass and metals without cracking, peeling or degrading. Also resistant to scuffing and smearing. Compatible – Tubes labeled with Direct Thermal CryoTags easily slide in and out of centrifuge rotors without binding. Specially Designed – Labels accept printing from direct thermal printers such as Dymo LabelWriters. Barcoding –Print popular barcode formats for fast and easy sample identification. * NOTE: Prolonged exposure to alcohol may cause material discoloration. 77577-1 77593-1 1.05" x 0.50"
77577-2 77593-2 1.50" x 0.50"
77577-3 77593-3 1.50" x 0.75"
77577-5 77593-5 2.00" x 0.25"
77577-6 77593-6 1.50" x 0.50"
Our Direct Thermal labels are designed to work with U.S. Model Dymo printers. Available colors: White (W), Blue (B), Green (G), Orange (O), Red (R), Yellow (Y). Note: All labels are White and are on 1" I.D. cores with 2,000 per roll. 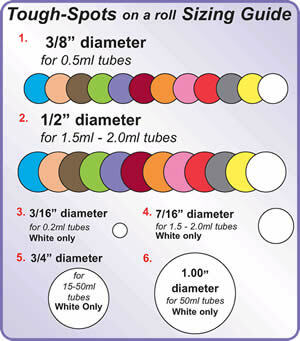 100% Virgin Polypropylene tubes are recommended for optimal performance. Avoid the use of siliconized surfaces. Xylene-Resistant - Polyester labels provide strong solvent resistance, specifically to multiple xylene washes as well as longer term exposure to xylene. Versatile – Temp. Range: -40°C to 121°C. 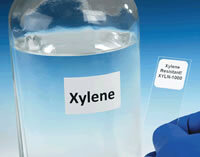 Xylene labels resist boiling water baths, autoclaving and moderate freezer temperatures. Specially Designed - Rolls are specially top-coated to readily accept thermal transfer printing. 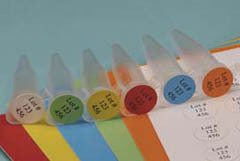 Convenient – Labels are available in a microscope slide size as well as a unique general purpose size for multiple uses. These labels will withstand exposure to acetone, acetonitrile (ACN), alcohols, dimethyl sulfoxide (DMSO), hexane, methyl ethyl ketone (MEK), toluene, xylene, and other harsh chemicals and solvents. They are ideal for the identification of microscope slides and tissue cassettes in cytology and histology labs. Intended for use on flat surfaces. Can be printed with most brands of thermal transfer barcode printers. Will not acquire coloration from histological stains and will maintain the white background through staining procedures. 77425-01W W 1" 0.75 x 0.75"
77425-02W W 3" 0.75 x 0.75"
77425-03W W 1" 0.866 x 0.59"
77425-04W W 3" 0.866 x 0.59"
77425-05W W 1" 0.866 x 0.75"
77425-06W W 3" 0.866 x 0.75"
77425-07W W 3" 0.866 x 0.75"
77425-08W W 1" 0.875 x 0.875"
77425-09W W 3" 0.875 x 0.875"
77425-10W W 1" 0.875 x 0.875"
77425-11W W 3" 0.875 x 0.875"
77425-12W W 1" 0.9 x 0.75"
77425-13W W 3" 0.9 x 0.75"
77425-14W W 1" 0.9375 x 0.9375"
77425-15W W 3" 0.9375 x 0.9375"
77425-16W W 1" 0.9375 x 0.9375"
77425-17W W 3" 0.9375 x 0.9375"
These labels are ideal for the identification of cassettes* routinely used in tissue and biopsy embedding and processing**. 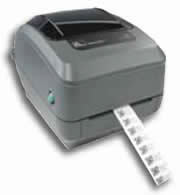 They can be printed with most brands of thermal transfer barcode printers using TC-class ribbons. Will not acquire coloration from histological stains and will maintain the white background through staining procedures. **Preliminary testing is strongly recommended for use in automated vacuum tissue processors. 77425-18W W 1" 0.75 x 2"
77425-19W W 3" 0.75 x 2"
77425-20W W 1" 1 x 0.25"
77425-21W W 3" 1 x 0.25"
77425-22W W 1" 1 x 0.276"
77425-23W W 3" 1 x 0.276"
Use these high temperature labels for the identification of various containers and surfaces for autoclaving and dry heat sterilization. Apply them to metal, plastic, and glass surfaces. They will withstand autoclave sterilization cycles at 132°C (270°F) at 30psi pressure. These labels and their print will survive high temperature exposures and are ideal for identifying containers and surfaces that need to be sterilized inside autoclaves, dry-heat sterilizing equipment and gamma irradiators. 77426-01W W 1" 1 x 0.6875"
77426-02W W 3" 1 x 0.6875"
77426-03W W 1" 1.3 x 0.625"
77426-04W W 3" 1.3 x 0.625"
77426-05W W 1" 2 x 1"
77426-06W W 3" 2 x 1"
77426-07x W, BL, G, O, P, R, Y 1" 2 x 4"
77426-08x W, BL, G, O, P, R, Y 3" 2 x 4"
77426-09W W 1" 2.25 x 1.25"
77426-10W W 3" 2.25 x 1.25"
77426-11W W 1" 2.63 x 1.125"
77426-12W W 3" 2.63 x 1.125"
High temperature removable labels for the identification of various containers and surfaces intended for autoclaving, dry heat sterilization and gamma irradiations. Removability of the labels should be tested on substrates in end-user conditions. 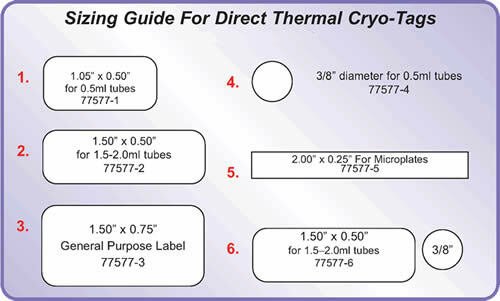 77426-13W W 1" 3 x 2"
77426-14W W 3" 3 x 2"
Dymo LabelWriters are compatible with direct thermal CryoTags® and Wet Grip labels. The Dymo has a small bench-top footprint, it is easy to setup and is very affordable. Ready-made templates will enable you to print in seconds. Barcoding is also possible. Ask for samples! Dymo and LabelWriter are registered trademarks of the Dymo Corp., an Esselte Office Products Co.
Labels dissolve under running water in less than 30 seconds. *A build-up of liquid water on the label surface will dissolve the material. 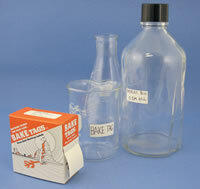 Pre-printed Wash-Off Labels make it easy to mark bottles containing harmful chemicals or reagents. These convenient labels will save time and improve the safety of every lab. Wash the labels away when the label is no longer needed.